Pruning trees and shrubs is all great fun, until you look at the pile of branches. Take care of them with an electric wood chipper shredder. These machines reduce the branches to useful wood chips that can be used for composting and a range of other purposes. We reviewed the five best electric wood chippers right here. Best of the best. If you want an electric wood chipper that runs quietly and smoothly, but don’t want to sacrifice chipping power or build quality, then the CSV-2515 is the machine for you. It will be heavier and pricier than most electric models, but this is hands down the best electric wood chipper and leaf shredder. 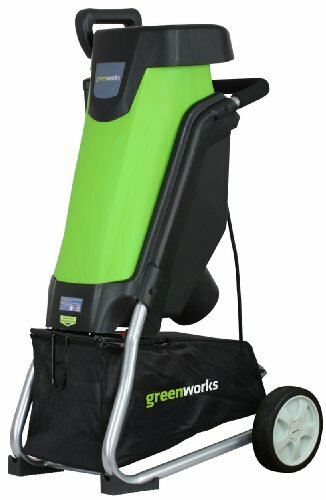 This shredder by GreenWorks showed a lot of promise because of its eco-friendliness and reliability, along with its 4-year warranty. However, its operating range is limited, as it isn’t able to handle small leaves or large branches very well. For lighter electric chippers, both in price and in operation, the Sun Joe is one of the best offers you can find. It handles branches of regular sizes very well and is easy to operate in a safe manner. The ES1600 is a bit heavier than other electric shredders, but this gives it a solid feel and added stability. If you shred a lot of smaller twigs and leaves it is a good option. However, there are better products if you want to shred regular to large sized branches. If you intend to use it to shred mostly straight branches, the GS70015 is the right tool for you. The collection bin makes chip disposal a breeze, and a user-friendly knob ensures you won’t lose a lot of time clearing up motor jams. Read more. Wood chipper or leaf mulcher? 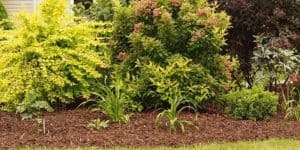 Getting rid of yard waste without the proper equipment can be very difficult. 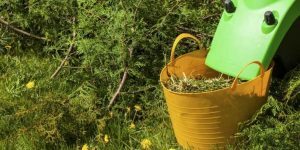 If not taken care of every so often, the waste will pile up, turning even the most beautiful garden into an unsightly mess. The best electric wood chipper shredders are designed to handle this problem in an efficient and convenient way. These tools can tackle different types of organic matter found in a garden and cut them up into much smaller pieces. Gardeners primarily use them to chop dead branches and prepare them for disposal. Some home improvement businesses rent these machines out for one-off use. Yet considering how essential they are to gardening, buying one of them could be a really good investment. 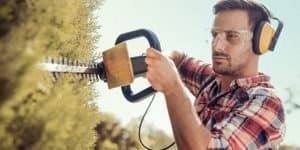 Because of how versatile these tools are, many gardeners look for the best wood chipper shredder to help make their daily job easier. In general, they serve three main purposes. 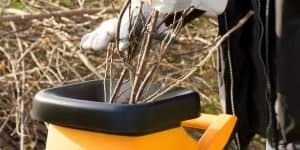 The majority of gardeners look for the best wood chipper shredder to cut up large chunks of garden waste into smaller pieces. This makes it much easier to dispose of them and tidy up the garden in the process. Some gardeners don’t just want to get rid of the waste. On the contrary, they want to recycle it and find good use for it in their gardens. 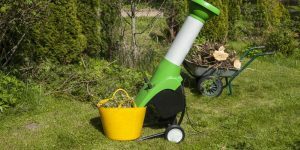 The best electric wood chipper models can break up organic waste into smaller pieces, thus allowing gardeners to create compost in a quick and easy way and treat old soil to increase its fertility. To control weeds and maintain moisture levels, gardeners have to place a layer of organic matter on the ground. 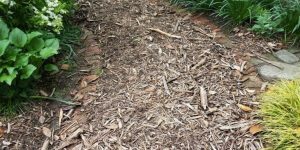 This process is called mulching and branches and leaves chopped up using some of the best electric wood chipper shredders out there make for an excellent organic mixture to use for this purpose. The best electric wood chipper models and leaf mulchers serve the same primary purpose. 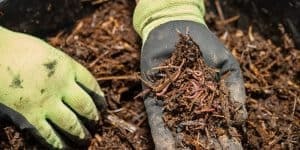 Namely, they cut up large pieces of organic garden waste into smaller-sized bits. These are used to create mulch, which is then placed on the ground to ensure optimum protection for the soil and the roots of plants. As their names suggest, they are intended to handle different types of organic materials. While wood chippers are used to cut up wood, leaf mulchers are used to do the same for leaves. Which of these two one goes for will depend on the type of landscape they have to maintain and the materials they need to dispose of. If they need something to cut up branches, they will opt for a wood chipper. However, if they are looking for a machine that can shred leaves, then they need a leaf mulcher. Some gardeners have to deal with branches and leaves at the same time. Luckily, most of the best wood chipper shredder products can handle both materials, thus eliminating the need to own two separate shredding and mulching machines. 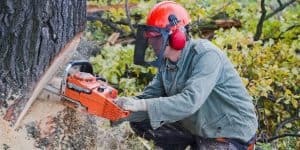 When looking for the best wood chipper shredder, customers can choose between an electric model and a gas-powered one. While the gas models tend to be more powerful, they might not be the best solution for gardening enthusiasts who don’t really need a machine with such strength. Plus, with the additional expense of gas, they are certainly not the most economical solution. 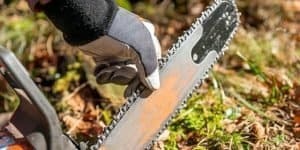 There are more benefits to using the best electric wood chipper shredders over gasoline-powered ones. They are designed to take up less space, which makes them ideal for home use. Furthermore, their size and weight makes it much easier to move them from one place in the garden to another. The best electric wood chipper models also don’t produce smokes or fumes that can actually harm the garden if used too frequently. Moreover, they don’t make nearly as much noise as gasoline models do. To use them, gardeners will need access to an electrical outlet, as well as a heavy duty extension cord. 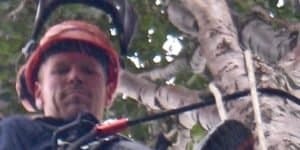 They are not as efficient at tackling larger tree branches as the gas-powered variants, which might not make them the perfect choice for larger gardens and other green areas. 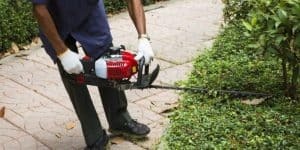 However, these minor shortcomings don’t overshadow the fact that gardeners can benefit greatly from using one of the best electric wood chipper for sale at the moment. Different types of wood chipper shredders use different mechanisms to achieve optimum results. The majority of the electric wood chipper shredders use the fairly simple disk design. This is because they are highly adaptable and can tackle a variety of organic materials. The basic mechanism consists of a disk-shaped flywheel that has sharp blades attached to its end. When in operational mode, the electrical current causes the wheel to spin at a very high speed, thus allowing it to swiftly cut through branches and sticks. The weight of the wheel affects how powerful the machine is. As a rule, heavier wheels will result in more cutting power. Similarly, wood chipper shredders with a lighter wheel won’t be as powerful as those with a heavier one. Because their mechanism utilizes electrical current, all of the best electric wood chipper shredders need to be positioned near an electrical outlet. If this is not possible, users will need an extension cord. Due to the nature of the terrain and sharp materials they will be working with, users should choose a heavy-duty cord that is highly resistant to punctures and humidity. In addition to this, using a heavy-duty extension cord is the only way to ensure that the voltage doesn’t suddenly drop mid-work, therefore causing unexpected changes in the cutting speed. In order to perform well, many of the best electric wood chipper shredders work at very high speeds. As such, some materials may discharge backward in the process, especially if the machine is overloaded. Because of this, it is better to divide garden waste into several smaller loads than attempt to jam it all in at once. 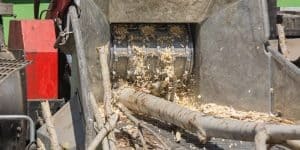 Even the best wood chipper shredder tools can eject materials backward, which may result in safety hazards for the person operating the machine. To prevent this from happening, users should wear protective gear, including safety glasses and helmets. Furthermore, it is recommended to wear safety boots in case they drop a larger piece of wood on their feet. Since the machine produces considerable noise, wearing some form of ear protection is highly recommended. Finally, users should always wear tight-fitting clothes and remove any jewelry before turning the machine on. This is because loose clothes might accidentally get caught in the machine, even when operating the best electric wood chipper out there. Owners must also make sure that the blades on the flywheel are sharpened at all times. Many of the best wood chipper shredder tools come with either a set of spare blades or a sharpener toolkit that makes their maintenance much easier. 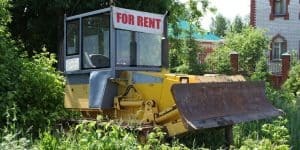 Before settling on a specific wood chipper shredder, there are several key features buyers should consider. Based on these, they can decide which model is the best wood chipper shredder for their landscape maintenance needs. The way they plan to use the machine will determine which model one will go for. Electric wood chippers are primarily designed to be used in residential areas, where most people have to get rid of smaller branches, shrubs, and leaves. Due to their environment-friendly design and the low noise they produce, electric models are great for use in cities and suburban areas. What’s more, most cities have rules in place that prevent the use of oversized gas models. The weight and size of the machine will affect its functionality, as well as its portability. If they go for a larger model, owners will likely have to find a semi-permanent location for it in their garden. They won’t be able to move it as much as they would a more compactly designed model. As explained in this article, the weight of the disk-shaped blade determines its cutting power. Because of this, it is much better to go for a heavier model, as it can cut through all types of organic materials. The input chute where operators place branches can be on the top of the machine, as well as on its side. Top-mounted chutes are easier to use for lighter garden waste, simply because the materials are dropped directly into the chute. On the other hand, the side-mounted chutes allow owners to insert larger branches directly onto the chipping blades. The wood is therefore immediately processed, without having to go through flails located on the top of the machine. The length and width of the chute determine the dimensions of the branches that the machine can process. Feed capacity tells owners how much waste they can feed into the machine in one go. Each chute has its own feed capacity, so it’s important to check these features out before choosing which model to buy. Usually ranging from 10:1 to 20:1, this number details the machine’s ability to cut large chunks of material into smaller pieces. For example, a chipper shredder with a 20:1 ratio can turn one large branch into 20 small-sized pieces. This means that each chunk will be just 5 percent the size of the original piece of wood. Manufacturers always specify the number of blades their machine is equipped with. The more blades there are, the longer they will remain in optimum condition. As a result, owners won’t have to replace them or have them sharpened too often, which will make maintenance much easier. If a machine comes with a warranty, it’s usually seen as a good sign as to its quality and performance. As a rule, higher quality chipper shredders usually come with a longer warranty period. If you’re looking for a lightweight tool to clear up all the fallen leaves and branches in your yard, then you’ll probably want an electric wood chipper. Remember, you’ll need to connect it to a power outlet and it won’t have the power of a gas-powered unit. However, this type of chipper is portable, easy to store and pretty quiet, which means there will be no complaints from the neighbors. Without further ado, let’s have a look at 5 of the best electric wood chippers. Purchase Patriot's Electric Cord (ASIN #B07886G47X) now and EXTEND YOUR CHIPPER’S WARRANTY ONE YEAR. The Patriot CSV-2515 is easily one of the most heavy duty electric wood chippers out there. In fact, it is so powerful that it can even compete with some gas chippers. However, this means that it is also noisier and heavier than most electric models. It feels very solid, but at 95 pounds, it is quite a bulky machine. 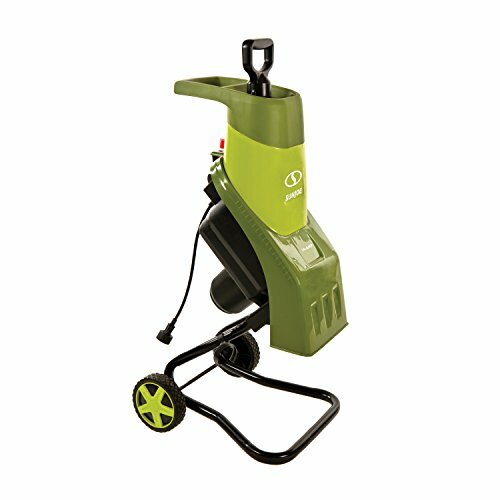 It can handle branches up to 2.5 inches in diameter, almost twice the size of other electric chippers. Bellow this size, it shreds pretty much all types of branches and leaves, provided you properly feed it. You can also attach the included collection bag to it to make debris disposal easier. Of course, as this wood chipper is designed for heavy duty jobs, it has a price tag to match. But with it, you also get a 2-year warranty, the collection bag, and a pair of safety goggles. GreenWorks is known for its eco-friendly tools, and the 24052 chipper is no exception. Obviously, because it is electric, it doesn’t use fuel or gas and has an impressive zero-carbon footprint overall. The fact that it comes with a 4-year warranty (twice as long as most of its competition) attests to its build quality. It can shred branches up to roughly 1.4 inches; however, we felt that as soon as the diameter deviates the slightest bit from this limit, the machine starts to choke. The 24052 also can’t deal with leaves very well. 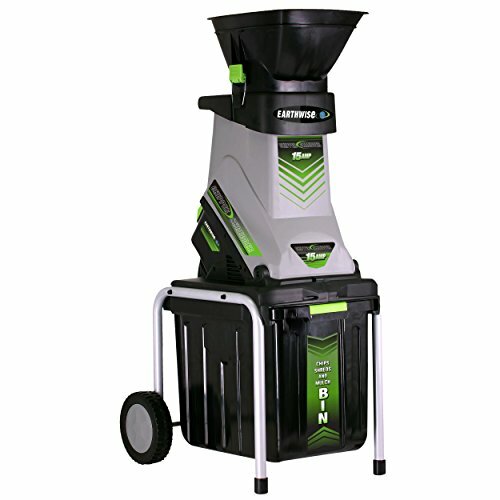 Lastly, this green shredder comes with a user-friendly paddle to help you feed materials into the hopper and an additional set of blades if the first ones happen to need replacing. 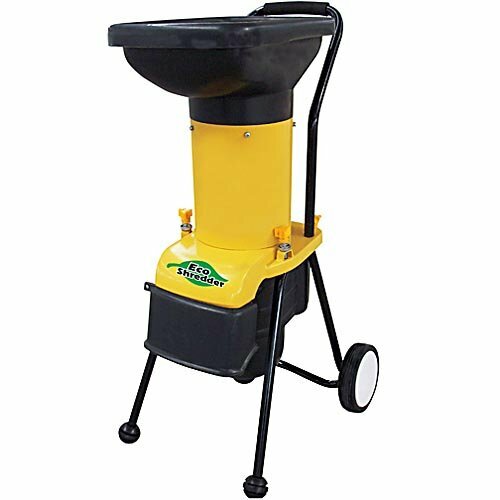 This compact Sun Joe wood chipper comes with a 14-amp motor and a pair of 6-inch wheels that allow you to carry it around effortlessly. In fact, you’ll have no portability issues, since it only weighs about 26 pounds. On the downside, it is a bit noisier than other small electric chippers. The Sun Joe CJ601E does not handle leaves and small branches so well, as these tend to go through the blades almost without being cut. However, for dry larger branches, about 1 inch in diameter, it boasts one of the best performances we found in an electric unit. It can even reduce pieces of wood to 1/16th of their original size. This Sun Joe wood chipper also includes a nice safety feature. The container has a locking knob that prevents the motor from operating while it is open, so you can handle it with that extra sense of security. The ES1600 is one of the most solid shredders we’ve found, featuring an excellent build quality. Because of its 70-pound weight, you lose a bit in portability, but can feel that this is a sturdy machine. The feed is divided into three parts according to size, so you can easily sort branches and leaves into each one. Surprisingly, this shredder can handle small twigs and leaves quite well, unlike others in this review. However, it does not handle larger branches as well. A great feature of the ES1600 is the overload protection switch. This switch will turn off the motor during a jam to safeguard both your security and the unit itself. Earthwise delivers perhaps the most versatile chipper on this list. The first thing that pops out is that it includes a collector bin, unlike any other product in our electric wood chipper reviews. While you can probably fit a bag or other container to most of them, this solution is much more practical and well thought out. The size constraint for branch thickness is 1.75 inches. Inside this range, it can handle almost all types of dry material, with some limitations. For very small leaves, you should also include small twigs in the feed to help with the shredding. It deals well with smaller and bigger sized branches, as long as the branches are straight and do not have any weird shapes. It also includes an overload protection switch and a lock that prevents the unit from operating while open. This combines very well with the knob that opens the motor, making it really easy to clear a jam. Three of the most popular electric chipper shredders currently on the market include the Durostar Eco-Shredder ES1600, the Patriot Products CSV-2515, and the Sun Joe CJ601E. All three models have a 14-Amp motor and can be plugged into a standard 110-120V electrical outlet. They also have a set of wheels that allow for easier transportation. In choosing the best electric wood chipper for home use, their other individual features were considered. At 16:1, the Sun Joe model has the highest reduction ratio of the three. The Durostar comes with a still sizable 10:1 ratio, whereas the Patriot Products one has a surprisingly small 8:1 reduction ratio. The Patriot Products can cut through branches that are up to 2.5 inches thick, which gives it a significant edge over the competition. The Sun Joe chipper shredder can handle branches of up to 1.5 inches, while the Durostar Eco-shredder can go up to 1.35 inches deep. Both the Sun Joe and the Durostar chipper shredders come with a one-year warranty and a 90-day return window. We’ve looked at 5 of the best electric wood chippers on the market. Some of them are more suited for heavy-duty jobs, while others can handle small leaves and twigs better. 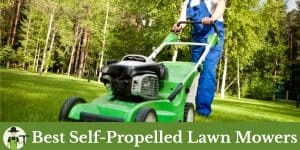 Hopefully, these reviews have helped you in your quest to find the perfect tool for your backyard. The choice of a good electric wood chipper shredder can make a world of difference in gardening and landscape maintenance. These machines are easy to handle and maintain and can chop up branches, sticks, and leaves into small pieces in a matter of seconds. They allow owners to clean up their gardens with ease and reuse organic waste for composting and mulching purposes. Electric wood chipper shredders are more portable and less noisy than the gasoline-powered models. On top of that, they don’t produce any gases or fumes that can harm the environment. All this makes electric wood chipper shredders a great tool for less demanding gardening and landscaping works. 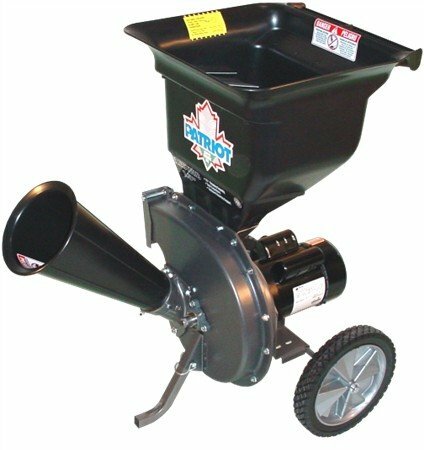 How to use (Snow Joe) electric wood chipper? The Snow Joe or Sun Joe wood chipper is very easy to use. Because it is electric, it is pretty much maintenance free. Make sure to set the unit up in a stable upright position. Plug the cord into a protected extension lead. Switch on the on/off button. Now feed the branches through one by one. Make sure to never stick your hands into the machine though! There is a plastic pusher tool included with the machine for the purpose of pushing the last bit of branches through the machine. What is the sound level of a electric wood chipper? They are not overly noisy like gas powered models, but still it is advisable to wear hearing protection. Where Are Electric Wood Chipper for sale? You can find electric wood chippers for sale in the most well known big box stores. The most well known examples are Amazon, Home Depot, and Harbor Freight. Otherwise your local outdoor power equipment store will usually carry at least one model. The advantage of buying online is that you are able to choose from a wider range, and get the bulky product delivered right to your doorstep. How to make electric wood chipper? I would not recommend making your own electric wood chipper. These machines rely on a lot of shredding power, and with improper use, they can seriously harm you. Always buy certified machines and wear proper PPE whilst using wood chippers. How to fix electric wood chipper? If you have to google this question, you’re most likely better off bringing your wood chipper shredder to a professional to get it fixed. If you take it apart and don’t properly put it back together again, you risk seriously injuring yourself and other people using the machine.